It is open from 9AM to 5PM daily, and it costs $3 per adult, $2 per senior citizen, and $1 per child to enter. I'd allow about an hour or so to explore the grounds and temple -- in fact it would be a great stop for a leisurely picnic lunch. 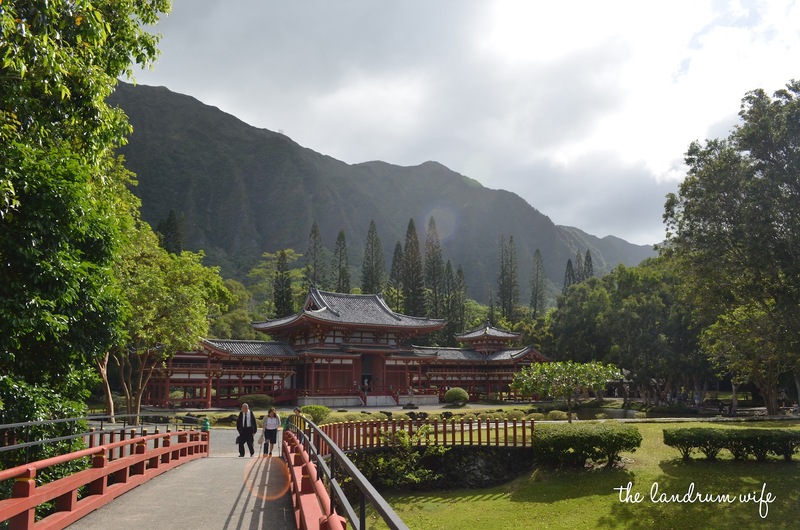 The Temple has appeared in numerous television shows including Hawaii Five-0 and Lost. It is actually a part of the cemetery, so please be respectful when visiting this beautiful area. Also remember to remove your shoes before entering the temple (there are signs to remind you in case you forget). Fun fact - it was actually entirely built without using a single nail! Wedding and funeral services are both frequently held here. 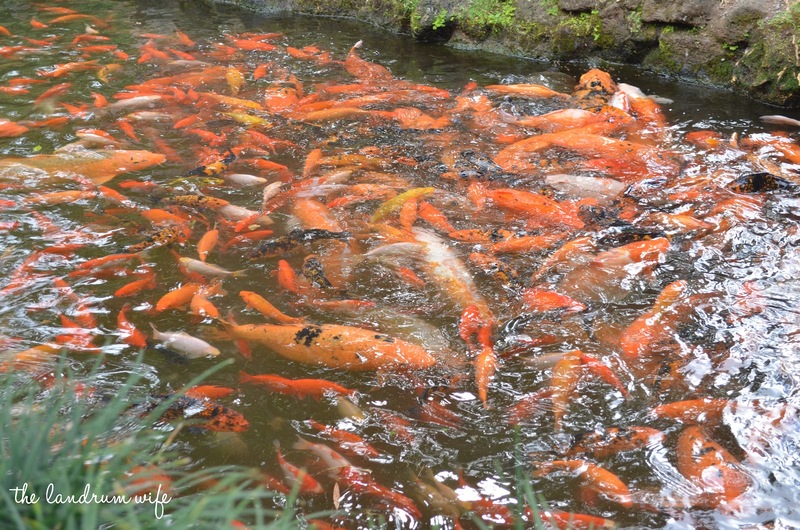 There are woods surrounding the temple and grounds, so if you are prone to mosquito bites it is probably a good idea to bring some bug spray. A gift shop with some novelty items is located on the grounds a bit behind the temple, and restrooms are behind the gift shop. 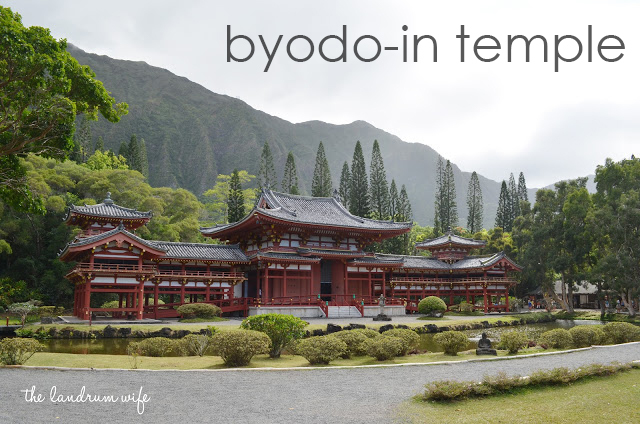 The Byodo-in Temple is a gorgeous, picturesque spot nestled at the foot of the Koo'lau Mountain Range in Kaneohe, Oahu. 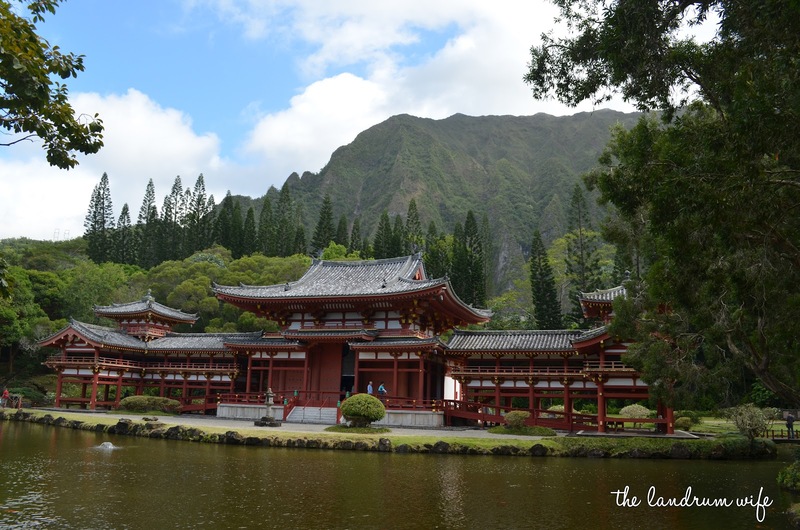 The Temple was established on the 100-year anniversary of the first Japanese immigrants to Hawaii and is a smaller-scale replica of the 950-year old Byodo-in Temple in Uji, Japan (a United Nations World Heritage Site). It's relatively easy to find (right off of Kamehameha Highway and through the cemetery) and it's a wonderful place to find some serenity and relaxation in what would probably be a very busy vacation! 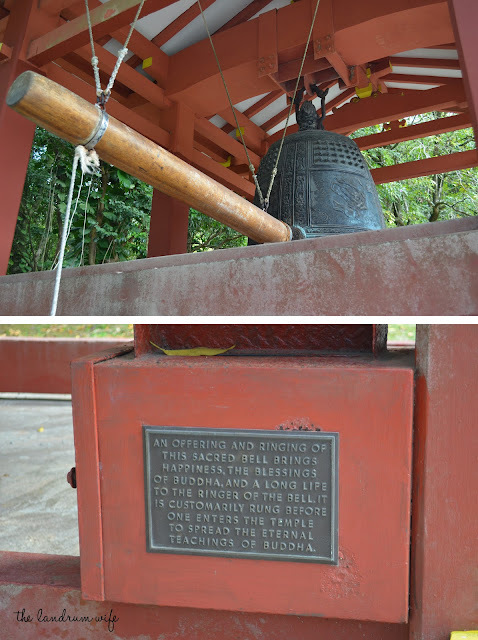 We started off counterclockwise and came first to the Sacred Bell (or Bon-sho). I can't remember if we wrung it or not, but there was a mom and kid in front of us that did! After that we wandered a little around the wooded area and pond close to the bell and admired the beautiful flowers and plants among the grounds. 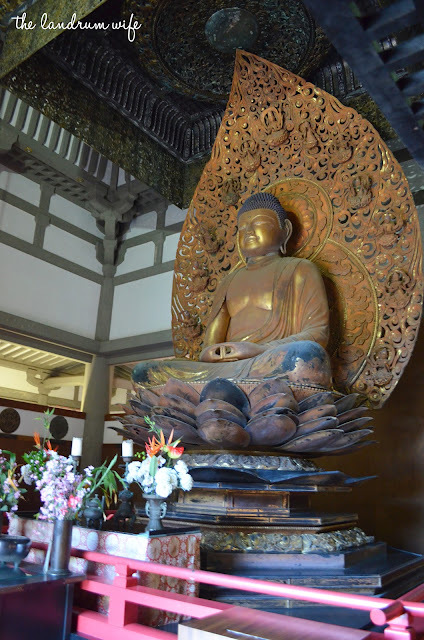 We then meandered to the temple itself, removed our shoes, and stepped inside to view the Amida Buddha, a golden Buddha unique to the entire world. It's huge -- apparently over 9 feet tall. 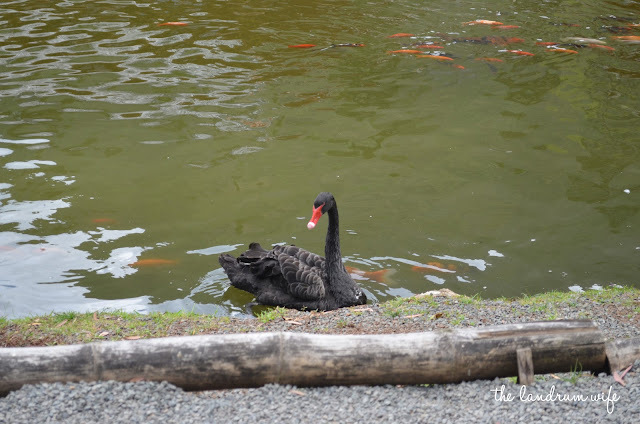 Afterwards we checked out the gift shop (a nice selection of potential souvenirs there at decent prices) and the wildlife in the ponds. 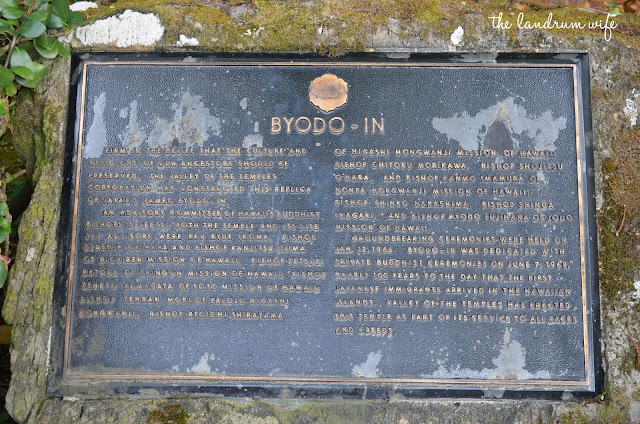 Overall, we had a nice, peaceful visit at the Byodo-in Temple. 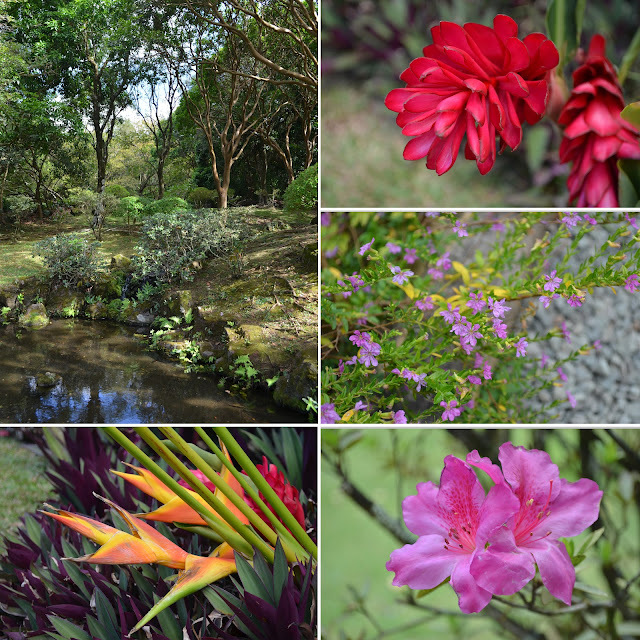 Although it doesn't take long to tour the grounds and temple, I still highly recommend stopping by, even if just for a picnic lunch, so you will be able to witness its beauty in person. Beautiful! I've been meaning to get over there! Love the idea of a picnic there. Are there tables?